Did you notice the little piggy badge in my right scroll bar? Yep, I'm doing Charcutepalooza. This is probably no surprise to people who know me. I've been dabbling with sausage making and meat curing since picking up Ruhlman and Polcyn's Charcuterie a few years ago. I know it sounds cheesy, but making my own cured meats is so satisfying. A part of it has to do with watching the transformation. A raw piece of pork loin becomes delicious Canadian bacon, and all it took was a little salt, time and a little smoke. I never new it was so simple. The first challenge was duck prosciutto, but I missed that. No worries. I plan to make that one up, but in the meantime, you get this month's challenge: BACON! But haven't you made bacon before? This challenge came at just the right time. I used the last of my stash in December so it was time to replenish. Through my butcher, I ordered 5 pounds of pork belly from Carlton Farms, located in Carlton, OR, about an hour's drive from Portland. Three pounds went to making a regular fresh bacon rubbed with Ruhlman and Polcyn's basic cure, black pepper and all spice. The remaining two pounds went to a little experiment I've been wanting to try. I rubbed the meat with basic cure, copious amounts of garlic, chopped lemongrass, finely sliced kaffir lime leaves and crushed galangal. (What can I say? I'm Thai.) Into the fridge it went for 7 days. After curing, I rinsed the bacon and allowed it to sit in the fridge for an additional 2 days to dry before divvying it up and throwing it into the freezer. I decided to slow roast a small portion of it (someone had to taste test it, after all) until the internal temperature reached 195F. This method of preparing pork belly (cured or fresh) results in tender, succulent meat. 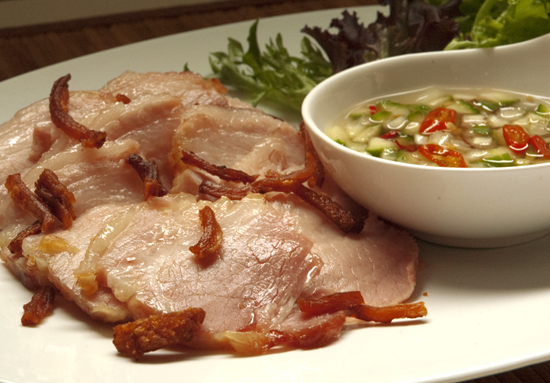 I served the bacon with ajat (Thai cucumber relish) and simple greens. The fat crisped up nicely, so I threw it on top, but crispy shallots would also do. Garlic, lemongrass, kaffir lime and galangal make such a wonderful flavor combination but I didn't know how much of it would come through in the final product. I normally don't add fresh herbs to my bacon because I've found the flavors don't come through very well. In this case, the flavor of the herbs was wonderfully bold. I was reminded of Isaan-style sausage. Served with the cucumber relish, it was salty, sweet, sour and savory— all the flavor components a well-balanced dish should have. Gosh, I'm going to need to make more of this stuff very soon. There are just too many things I want to do with it . For sure I'll be roasting more to use in banh mi (Vietnamese baguette sandwich). I would like to make meatballs / dumpling filling by grinding it up and mixing with an equal amount of ground pork. This would also be a great filling in an omelet or banh xeo (Vietnamese crispy crepe). Or how about in a lettuce wrap? Of course, I could also fry some up, like regular bacon, and eat it for breakfast with my eggs. There are just too many options! Well, one challenge down— just 11 more to go. Can't wait to see what the next one will be.